St Michael’s Church is an Anglican church which serves Caerwys and the surrounding area. It has a growing congregation, currently averaging over fifty for Sunday morning services. We are very pleased to welcome residents and visitors of all ages. 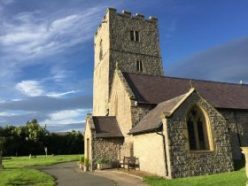 The church is part of the Denbigh Mission area and the Diocese of St Asaph, Church in Wales. The postcode is CH7 5PZ. As you enter Caerwys from the A55, turn right up High Street after the pharmacy, and turn left at the T junction at the top of the road. The church is open every day of the year from 9.00 am to 4.30 pm. You are welcome to look round our church during that time and we have sheets outlining the history of the church. There are weekly services. On Sundays we have services at 11.00 a.m. The west door, the main entrance, has level access into the church suitable for wheelchairs. On the first Sunday of the month at 11.00 am we hold our family service. On the second to fifth Sundays of the month the service is Holy Communion, at 11.00 am.